Our style of Karate the Shorin-Ryu Shorinkan is one of the oldest most prestigious styles of martial arts in the world. It is important to realize that there are currently four major branches of Shorinryu Karate practiced in the world today, Kobayashi-Ryu, Shobyashi-Ryu, Matsubyashi Ryu and Matsumura Seito. In the Shorinkan we practice Kobayashi Shorin-Ryu. The Shorinkan is headed by Hanshi Shugoro Nakazato Sensei, a man who is literally considered an intangible cultural asset of Karate by the Japanese government. Our Karate rank comes directly from Okinawa Japan and is internationally recognized by Karate practitioners. This means that getting a black belt in the Shorinkan from Peaceful Warrior Martial Arts & Healing Center will allow a person to train and be recognized as a black belt worldwide. Shugoro Nakazato Sensei’s patch is worn on the left chest of thousands of Shorin-Ryu practitioners world wide. The Shorin-Ryu Shorinkan has Hundreds of Karate school worldwide and hosts International camps and seminars to help spread karate throughout the world. The patch itself is circular, just like most traditional karate patches, to represent the full circle of martial arts training from student to teacher and back to student again, everything in Karate from techniques to principles, always moves in a circle. Originally new students were given red belts not white belts and masters simply returned to the red belt representing that they had traveled full circle. The Japanese writing on the patch is called Kanji, the small writing on the bottom reads “Shorin-Ryu” which means “Small Pine Style” and the larger writing above it reads “Shorinkan” which means “Small Pine House.” Karate had its influences from Chinese Kung Fu, Japanese Jujitsu and the original Okinawa art of Te. “Shorin” in Japanese means the same thing as “Shaolin” in Chinese and therefore it is possible that Shorin-Ryu Karate may have been influenced by Shaolin Kung Fu and Feeding Crane Kung Fu. Inside the red and white Shuri gate or “Shureimon” is some smaller Kanji that read “Shu Rei No Kuni” which literally mean “Land of Propriety.” The gate on the patch represents the mane gate leading to the Shuri castle or on Okinawa. The Shureimon was a gift to Okinawa from China. Okinawa Karate dates to the sixth century when Bodhidharma's (Daruma), travels took him to China where he settled at a Shao-lin (“Shorin” in Japanese) Monastery. The introduction of ch'uan-fa (“first way”) occurred in the late 1300's with the expansion of trade and cultural exchanges between Okinawa and China. Evidence suggests that te (“hands”), in fact was the indigenous fighting art of Okinawa (the birthplace of Karate). Te was taught in all three major cities: Shuri, Naha, Tomari, which lead to the original styles of Okinawa Shuri-Te, Tomari-Te and Naha-Te. It was mixed with ch'uan-fa to develop tode (“Chinese hand”), which would turn into modern day Karate (“empty hand”). 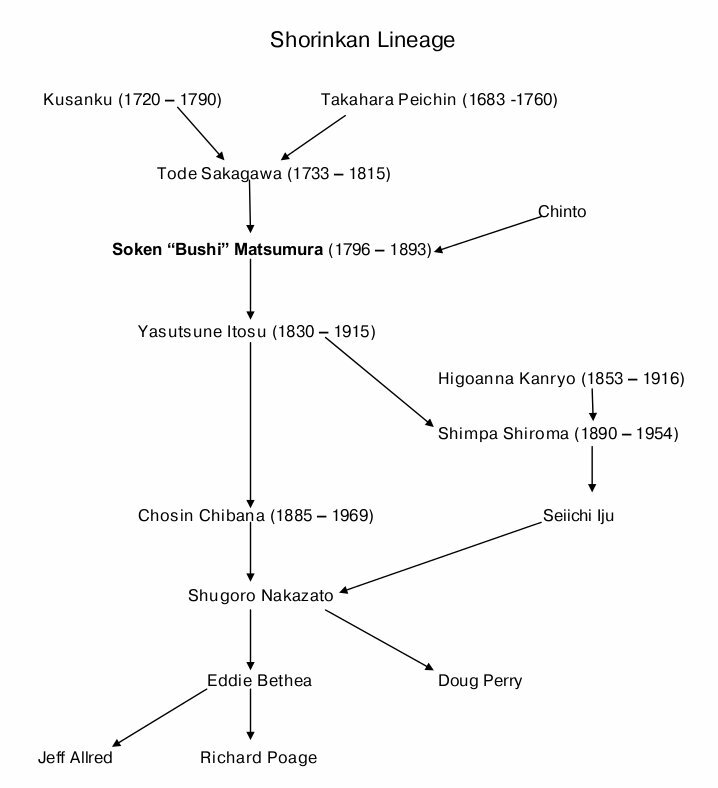 This begins the lineage of Shorin-Ryu from the original tode system of Shuri-te. Kusanku was sent to Okinawa as an ambassador of the Qing Dynasty, as documented in 1761. He resided in the village of Kanemura, near Naha city and instructed Takahara Sakugawa after the death of his first instructor, Takahara Peichin. Kusanku's name is associated with several kata in the Shorin-Ryu styles. Tode Sakagawa began his study martial arts under. One day he came across Kusanku standing on a bridge overlooking the water. Sakagawa, being the rebellious young bully, attempted to push Kusanku off the bridge. As he moved to push Kusanku from behind, Kusanku suddenly sidestepped the attack and knocked him into the water, then gave Sakagawa a harsh lecture about respecting his elders, the point being that a karateka needs to know “why,” not only “how.” Sakagawa studied under Kusanku for six years. When Kusanku died Sakagawa developed the first version of the Kusanku kata to honor his teacher's memory. Soken "Bushi" (Warrior) Matsumura was the first to systematize Shuri-te from which the various Shorin-ryu styles have been passed down to us today. Born into a prominent family in Shuri, Matsumura was a good scholar and athlete. He learned the fundamentals of chi na as a young boy (customary for upper class youths of the time) and later, according to many historians, began his formal martial arts training under Tode Sakugawa. From Sakugawa he is said to have learned use of the bo and the kata Kusanku. While serving as a bodyguard and martial arts instructor to the last three Ryukyuan kings, Matsumura made a number of official visits to China and Japan where he studied Chinese boxing and Japanese swordsmanship. Following retirement from service to the royal family, Matsumura taught Karate in Shuri. Among his many noteworthy students were Itosu Yatsutsune, Kentsu Yabu, Chomo Hanashiro, Gichin Funakoshi, Chotoku Kyan and Nabe Matsumura. 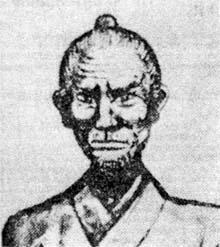 Sokon Matsumura is credited with having originated or having developed important variations of many Shorinkan katas including Gojushiho, Kusankudai, Pasai Dai (Matsumura No Pasai), Chinto, Naihanchi Shodan and Naihanchi Nidan. Born in Shuri, Itosu began his Karate training at an early age under Sokon Matsumura and subsequently trained under several other teachers, possibly including Kosaku Matsumora of Tomari. Well-educated in Chinese and Japanese literature, Itosu served as a translator to Sho Tai, the last of the Ryukyuan kings, until Sho Tai's fall from power in 1879. In 1901, Itosu first introduced Karate into the physical education curriculum of the Okinawa public school system. This was a crucial step in transforming the public perception of Karate as a feudalistic killing art to one in which the emphasis was in health and spiritual well-being. Itosu created the original Pinan (peaceful mind) katas, Shodan through Godan, practiced today in various forms by virtually all Shorin-ryu styles. 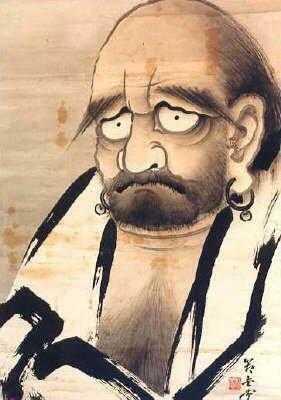 He is also credited with developing the Shorinkan Naihanchi Sandan, Pasai Sho and Kusankusho. A list of Itosu's students reads like a who's-who of famous Karate masters and includes Gichin Funakoshi, Chomo Hanashiro, Chotoku Kyan, Chosin Chibana, Kentsu Yabu, Choki Motobu, Kenwa Mabuni and Shigeru Nakamura. Choshin Chibana was born on June 5, 1885, at Tottori-cho in Shuri City, Okinawa. He began his karate training with Yasutsune "Anku" Itosu in 1900 with whom he studied until Itosu's death. In 1920 Chibana opened his first dojo in Tottori-bori and later a second in Kumo-cho Naha where he instructed until he suspended his teaching during WWII. Chibana sensei is credited with creating the three kihon kata that we practice in the Shorinkan. Hanshi Judan Nakazato has spent most of his life in the martial arts and in 1967, after nearly twenty years of training, was awarded Ninth Dan by his eminent instructor Chibana Choshin. Upon Chibana Sensei's death in 1969, Nakazato Sensei became the president of the Okinawa Shorin-Ryu Shorinkan Karatedo Kyokai, and was promoted to Tenth Dan in 1980. Nakazato Sensei is one of the most influential living Karate Grand Masters in Okinawa and travels many times a year to promote the traditional Okinawa Shorin-Ryu Shorinkan Karate (Kobayashi-ryu) system. Hanshi Jundan headed the Okinawa Karate delegation and was asked to give a special performance at the 1996 Olympic Games in Atlanta, Georgia. In May 1999, he led an Okinawan seminar delegation of Grand Masters to the United States promoting the first Okinawa Traditional Karatedo & Kobudo World Tournament. In addition, Hanshi Judan Nakazato is credited for the introduction of the Gorin kata. In August 2000, the Okinawan Prefecture Board of Education bestowed upon Hanshi Nakazato the title of "Kenmukei Bunkazi" Intangible Cultural Asset. Hanshi Judan Nakazato's recognized current influential first generation students in the United States include Kyoshis: Nabil Noujaim, Patrick Haley, Eddie Bethea, Eberhard Welch, Noel Smith, C.D. Williamson, Chris Estes, Sean Riley, Kevin Roberts, Cheech Luzzi and Hanshi Doug Perry, to name a few. Eddie Bethea’s interest in martial arts was piqued years before he left to serve his country. Relatives who had served in the military would talk about Judo after coming back from World War II. Later, the television show “Wild Wild West” caught his fancy with all the kicks and choreographed stunts. 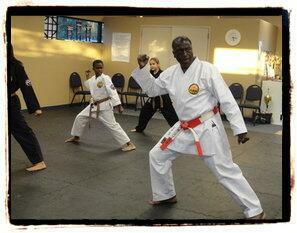 But it wasn’t until his first tour in Okinawa that Bethea took his first karate class. On the bus ride from one air base to another, Bethea saw a simple sign that caught his attention. The sign said “Karate Gym.” After he was processed into the new base, he started to take karate lessons. Bethea began training with Shugoro Nakazato Kyoshi, a man who would play a significant role in Bethea’s life for the next three decades. During his training with Sensei Nakazato, Bethea never trained with any ranks lower than a brown belt. This accelerated his learning, although he said it was very punishing at times. With a new found passion in life, Bethea had almost unknowingly taken the first steps in what he now calls his life’s mission. It didn’t matter where he was stationed, he found time to continue his training wherever he went. He took military leaves and returned to Okinawa to study with Sensei Nakazato. Although his time was limited, the visits and intense training sparked Bethea to continue with his training on his own. By January 1968, just two years after his first lesson, Bethea was promoted to fourth degree black belt and received his certification from his Sensei to be an instructor. He currently holds the rank of eighth degree black belt and is a member of the United States Karate Alliance Hall of Fame. Doug Perry began his fighting career in 1946 as an amateur boxer in Charlotte, N.C. at the age of nine. During his boxing career he participated in 147 bouts in the Golden Glove, AAU and the Marine Corps. He won state, regional and national titles and officially retired from the ring in 1959 following the trials for the 1960 Olympics. At the age of 14, he had the distinction of fighting a four-round exhibition match against bantamweight champion of the world, Willie Pep. 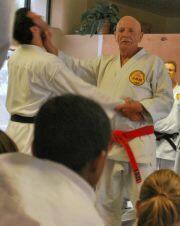 Perry started his martial arts training in 1956 at Paris Island. Since that time has had the opportunity to train under Hanshi Tatsuo Shimabuku in Ishshinryu Karate-do, Kyoshi Bill Hayes of Shobayashi Ryu (one of Hanshi Eizo Shimabukuro's senior students), Sensei Kanei Uechi of Uechi-ryu and Sensei Takemyoshi of an Old Okinawa family system. During the period 1974-75, again in Okinawa, he studied with Kyoshi Jiro Shiroma, a senior student of Hanshi Shugoro Nakazato. Since that time, he has been a student of Hanshi Nakazato. In 1997, Perry received the rank of eighth degree black belt from Hanshi Nakazato and was appointed to represent the Shorinryu Shorinkan Kyokai in North America. On January 5, 2009 in Okinawa, Perry was promoted to ninth-degree black belt, and now holds the title of Hanshi Doug Perry. He is the first non-Okinawan to achieve this ranking. Perry presently operates a dojo in Hendersonville, N.C.